The deed history of this property goes back as far as 1899 when it was deeded from AG Wamble to George Hughes. George Hughes was a prominent local contractor and carpenter, who was a native of Tennessee, and a resident of McKinney, Texas since 1872. He married his wife, May Powell Middleton on December 28,1904. Mr. Hughes was a charter member of the Central Presbyterian Church. The Hughes had one daughter, Mary Elizabeth Hughes who went on to many Armyn McKinney. George Hughes paid Mr. Wamble $300.00 in cash for the property. In 1903 the property was deeded to J. Frank Crozier, who paid $285.80. Mr. Crozier paid $100.00 in cash and the rest was accounted for in promissory notes. Mr. Crozier lived in Gainesville and Mckinney, before moving to Dallas in 1917. He worked in the traffic department of Western Union for 45 years, and was active in Oak Lawn Methodist Church and choir, the Washington Masonic Lodge, and the Woodmen of the World, from which he received a 50-year membership award. In 1918 the property was deeded to R.L. Davis through a warranty deed for $2,350.00 in cash. He was a beloved, local physician. FL L. Davis was born November 6, 1865 in Farmersville, Texas. R. L. Davis went to medical school in Lebanon, Tennessee, but some of his first medical experiences were under Dr. John A Poland. He began his practice in the vicinity of Princeton as a country doctor. Robert Lee Davis married Lenora Chapman, also known as Nora, and the family moved to McKinney in 1918 where he continued his medical practice until his death in September of 1952. Mr. Ralph Henderson who owned the property in later years remembers a neighbor telling him that Dr. Davis did have an office in the home at one time. When Dr. Davis passed away at 86, his wife, 4 daughters, 10 grandchildren, and 8 great grandchildren survived him. Dr. Davis was known to be a Pioneer Collin doctor, and one of Collin County’s finest medical men, having practiced medicine for sixty-five years. Dr. Davis was a member of the Collin County Medical Association, the Texas Medical Association, and the American Medical Association. He also served for several years as Health Officer of McKinney and Collin County. Dr. Davis was also an active member in the lst Baptist church. The National Register of Historical Homes application states that it is believed that the home at 710 N Church Street was built for Dr. Davis and his family, however, the timelines are not in line with when the home is believed to have been built-circa 1895. Ralph Henderson, a future owner of the property, remembers being told by a lady who had lived across the street since 1909 that the home was completed and occupied when she moved on to the street. Based on that information, the home was built several years prior to when the Davis family purchased it. Dr. Davis is buried at Restland Memorial Cemetery. September 8, 1921 J.S. Hill purchased the home from the Davis family for $5,500 cash. J.S. 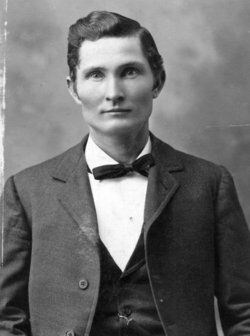 Hill was born on a farm near Ponotoc, Mississippi on March 1, 1848, and he was reared near Oxford. He married Berthenia Elizabeth McAnally on November 25, 1872. In 1884, Mr. Hill moved his family to Texas and settled in Melissa where he operated a gin and 2 farms. Mr. Hill was a Masonic Lodge member in Melissa. On April 13, 1921 the Melissa Cyclone destroyed his residence and he purchased the home in McKinney at 710 N Church Street where he lived until he died. In Melissa, Mr. and Mrs. Hill were members of the lst Baptist church, but upon moving to McKinney, Mr. and Mrs. Hill became active members at First Church. They were known to be staunch, substantial citizens who reared their children in a Christian home and were noted for their honesty and integrity. Mrs. Hill was said to have a quiet disposition, she loved her home, and found joy in spending time with her children and grandchildren. It was said that Mr. Hill never fully recovered from the shock related to the devastation created by the Melissa cyclone and his physical health continued in a slow decline after the disaster, until it was relieved by death. He was known for his impact on civic progress and for being a righteous being. He was considered an example for youth to emulate. Mr. Hill sought at all times to be useful to the community, friends, and neighbors as he scattered his good will. He lived in Collin County for 43 years and McKinney for 5 years before his death at 79 in the Church Street home at 8:35 pm on January 13,1926. Surrounding his couch when he passed away were, his devoted wife, six surviving children, grandchildren, other relatives, intimate friends, and neighbors. The funeral was held the following afternoon by Dr. M.E. Hudson, pastor, in the home on Church Street, and he was buried in Pecan Grove. Three of J. S. Hill’s brothers were influential in the area. Joe Hill was manager of the St. George hotel in Dallas, J. L. Hill was a McKinney grocery merchant, and Green Hill was a cotton man and merchant in Wylie. Mrs. J. S. Hill also died in the church Street home in December of 1935, at the age of 82, after a week of “critical illness of heart trouble.” She had experienced frail health for a few years, but was “bedfast” for the last week. Her funeral was held in the home at 710 N Church Street by pastor, Dr. J. H. Cozad, and she was buried in Pecan Grove Cemetery next to her husband, J. S. Hill. Mr. and Mrs. Hill’s daughter, Mary Hill, resided with her Mom and tenderly cared for her in her latter years. After J.S. Hill and his wife had passed away, the home was apparently left to the children, one of whom lived just down the street at 612 N Church Street. A.G. Speck had married one of the daughters, Mona Hill. AG Speck was a native of Tennessee, but had resided locally for about 60 years. He was employed with Collin County Mill and Elevator Company in McKinney for 54 years. He was a deacon in the lst Baptist Church at the time of his death in November of 1950. Mona Hill Speck was a native of Mississippi, but spent most of her life in McKinney. She was a faithful member of lst Baptist Church and was active in Sunday School and the Woman’s Missionary Union. She passed away in December of 1959. At the time of her death, she resided at 612 North Church Street. In April, of 1937 the property at 710 N Church Street was deeded from the siblings to Mary Hill, who had remained in the home, by warranty deed for $1.00. Mary was the single daughter of Mr. and Mrs. JS Hill. Mary was a member of the lst Baptist Church and worked as a bookkeeper for Southland Ice Company in McKinney. She died in Wysong Hospital after an extended illness in January of 1968. On July 3,1968 James and Dean Burnside purchased 710 N Church Street for their family home from Mary Hill’s estate for $9,750 cash. It was sold to them complete with & of the antique furnishings and personal effects. Denice Burnside Webb, James and Dean’s daughter, recalls playing dress up in vintage clothing, purses and jewelry to match! She still has several pieces that belonged to Miss Mary Hill. James Burnside was a fireman and Dean Burnside was a real estate agent with Bill Sportsman and Associates. Denice remembers having lots of church youth parties and girl’s slumber parties. Mr. Bumside was the baby of 14 children, so they had HUGE Thanksgiving and Christmas celebrations. Denice remembers 10 foot tall “real” Christmas trees and sliding down the banister! She also remembers sitting in the parlor with Jack, the man she eventually married, when she was 16. Her brother, Jerry occupied the entire upstairs in the beginning, but when he left for the seminary in 1970, Denice moved from the downstairs bedroom to the entire upstairs and that is where she had many memorable slumber parties! The back yard was the perfect setting for many games of horseshoes, badminton, and cookouts in a big stone grill. Denise remembers that the garage apartment was always rented with newly weds who became part of the family in no time. One of those tenants in the 60’s was Jimmy Gotcher, who recently retired from the McKinney Fire Department. Denice Webb Bumside is now a local realtor and her brother, Jerry, has pastored for the last 30 years in Oklahoma. In April of 1974, the property was sold to Ralph and Ona Henderson for $14,010. Ralph worked in construction, building metal buildings, and his wife, Ona worked for what was then known as Republic National Insurance Company and is now American General Life Insurance. They loved the home because of its age and they loved antiques which were perfect for decorating this home. After retiring, Ralph and Ona frequently traveled. Ralph remembers many conversations with an older lady, whose name he does not remember, who lived across the street. She had moved into her home in 1909, and had known most of the inhabitants of the home at 710 N Church Street He says he just wishes that he had tape recorded those conversations! Ona Henderson’s health began to decline and she passed away in a nursing home in 2003. Ralph found it difficult, both financially and physically to keep up the property. He says one of the hardest things he has ever had to do was to sell the property, but it was time. After selling, he moved in with his daughter, Joy Henderson, in Kaufinan, TX. 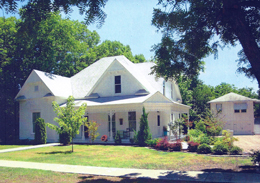 During the time the Hendersons owned the home their application was approved to add the Davis-Hill house to the National Register of Historic Homes. In July of 2006 710 N Church Street, known as the Davis-Hill House was deeded to Tom W. Pingleton, a resident of McKinney. His friend and business partner, Paul Phebus moved into the home and began the extensive process of restoring the home to its original grandeur. In addition to all of the work that Paul, a 30 year resident of McKinney, has put into this home, he has spent countless hours restoring many other historic homes in McKinney. Paul has also served on the McKinney City Council, District 2 from 1984-1986 and he served on the Housing Standards Committee from 1982-1984.